Boiling water bath canning is the easiest way to make shelf-stable jams and pickles right in your own home. It’s important to note that only high-acid foods can be preserved by water bath canning. This includes most fruit preserves, including jams, jellies, and fruit canned in syrup, and many pickles. However, always make sure you are using a safe, tested recipe from a reliable source, such as the National Center for Home Food Preservation. Non-acidic vegetables, meat including poultry and fish, and soup stocks (yes, even vegetable stock) must be processed in a pressure canner, not a boiling water bath. Here is more info on boiling water bath vs. pressure canning. Though ready-made canning kits are often available right in hardware stores, or for sale online, you may have many of the necessary pieces of equipment already in your kitchen. If so, you can selectively buy the other pieces and possibly save money. Place a rack in the bottom of a tall pot, like a stock pot or a lobster pot. The rack keeps the bottoms of the jars elevated off the bottom of the pan, allowing evaporating water to escape around the jars and preventing them from rattling against each other, which could cause breakage. Add enough water to cover the jars you are going to process by at least one inch above the lids. Turn on the heat. If raw-packing, bring the water to 140ºF; if hot-packing, bring the water to 180ºF. You can do this while you are preparing your foods to be canned. If the manufacturer of your jars and lids instructs you to, heat the jars in the water bath, and lids in a separate container of hot water. Ball Jars recently changed their recommendation, saying this is not necessary for their products. For Ball and Kerr products, wash your jars and lids with hot, soapy water just before filling, and rinse and dry well. Alternatively, run the jars (but not the lids) through a cycle in the dishwasher. Working swiftly, use a ladle to fill your canning jars with the recipe you have made. Leave an appropriate amount of headspace, usually between 1/4” and 1”, between the top of the food and the rim of the jars. This should be specified in the recipe. Run a clean spatula or chopstick around the interior of the jars to release any air bubbles that may be trapped. Wipe any trace of food off the rims with a clean, moist towel or paper towel. This allows better contact of the lid and the jar, ensuring a better seal. Place the round canning lids on the jars; this is where the magnetic lid wand comes in handy, allowing you to nab them one at a time. Screw on the bands onto the jars until just finger-tight. You want them to be securely screwed down onto the jars, but not so tight that air cannot escape during the canning process. If you have a rack with handles, load the jars into the rack and lower it into the water bath. Otherwise, Carefully lower your filled jars into the boiling water using a jar lifter or tongs, being careful to keep the jars vertical so as not to let the food make contact with the rim of the jars. There should be at least 1” of water above the top of the jars. If there is not, add more hot water until the level is sufficient. This is where the kettle comes in handy. There should be at least 1/2-inch of space between the jars. Turn up the heat, and bring the water to a full rolling boil. Put the lid on the pot. Start timing according to the recipe you are following. Canning recipes that call for a boiling water bath will include an instruction like "process for 10 minutes." The processing time doesn't start until after you've put the jars of food into the water and the water has returned to a full boil. If the water is boiling too vigorously, reduce the heat until it comes down to a more gentle but still full boil. When the processing time is up, turn off the heat, and let the jars settle for five minutes. Remove the jars in their rack or using a jar lifter or tongs when the processing time is complete. Lift the jars vertically, being careful not to tilt them, as this can cause the food inside to interfere with the seal of the lid. Transfer them to a cooling rack or towels on a counter, allowing 1” between jars. Be careful not to set them directly ​on counters or in a drafty place, which may cause temperature shock and can cause breakage. Let them cool undisturbed for 12 to 14 hours. Do not disturb the jars or lids during this time. You will hear a pinging sound as the lids flex and seal. This is normal. After the cooling period, test whether the jars have sealed correctly by pressing down on the lids. If sealed, they won't wiggle and will feel solid when you press on them. Remove the rings. Test the seal again by gently lifting the jars from the edge of the rim. You should be able to lift the jar from the tension of the lid alone. If any lids fail, refrigerate the contents and consume promptly. Alternatively, if no more than 24 hours have gone by, the contents can be reprocessed using the same method, with a clean lid and if necessary a new jar. 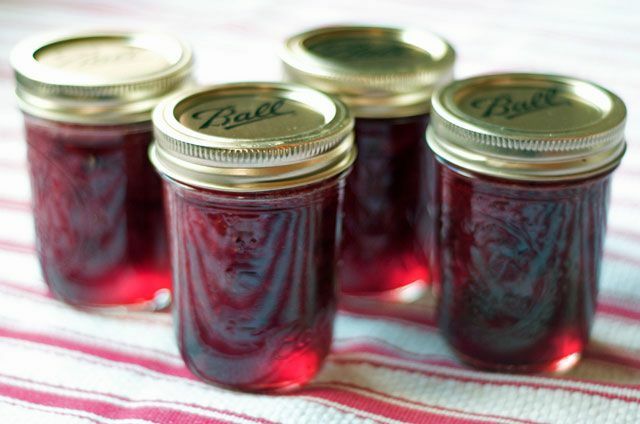 Wash or wipe down your jars with a moist cloth to remove any sugars or other residues from the canning process. Store them in a cool, dark place for up to one year. Here are a few more tips on how to store your home-canned foods.